Most churches, businesses, and organizations fail to prepare for any kind of disaster. The result is that each of these entities lessen their ability to survive and recover. However. a far greater tragedy is that the church often fails to minister in a positive and effective manner following disasters. Kentucky Disaster Relief’s strategy plan, “Ready Church,” enables congregations to Prepare, Connect, and Respond in times of disaster. This strategy empowers churches to be the hands, feet, and voice of Christ to their hurting neighbors. Ready Church also offers valuable discipleship in disaster preparation and practical wisdom in establishing effective response plans. God has placed the local church in a community to be a light that reflects the hope of Christ. Disasters create unique opportunities to share that hope and to offer the Good News of the Gospel. Ready Church enables believers to fill gaps of need and to make a life-changing impact on our neighbors and community. Communities across the Commonwealth have the potential for tornadoes, floods, ice storms, public shootings, earthquakes, severe storms, power outages, fires, industrial accidents, fatal vehicle crashes, and terrorist attacks. Kentucky has people who need Christ. Compassionate ministry creates opportunities to share the Gospel and hope of Christ. Disasters open doors that have often been closed to the Gospel, if churches are prepared to respond to our hurting neighbors with positive and caring ministry. You can contact Kentucky Baptist Disaster Relief at (502) 489-3527, (866) 489-3527, or at [email protected] for more information or to coordinate a Ready Church training in your area. Recently I had the privilege of visiting with Slate Hill Baptist Church in London, KY to share about ways to reach out to their community through the “Operation InAsMuch Kentucky” emphasis this September. In asking probing questions to learn more about the church and community I was really impressed to hear of the outreach this church is already doing. The WMU ladies shared about their sewing ministry. They showed me rack after rack of pillow case dresses (with matching flip-flops and doll dresses) and homemade dolls that they had made for little girls. For the boys they had made shorts and bought matching tee shirts. 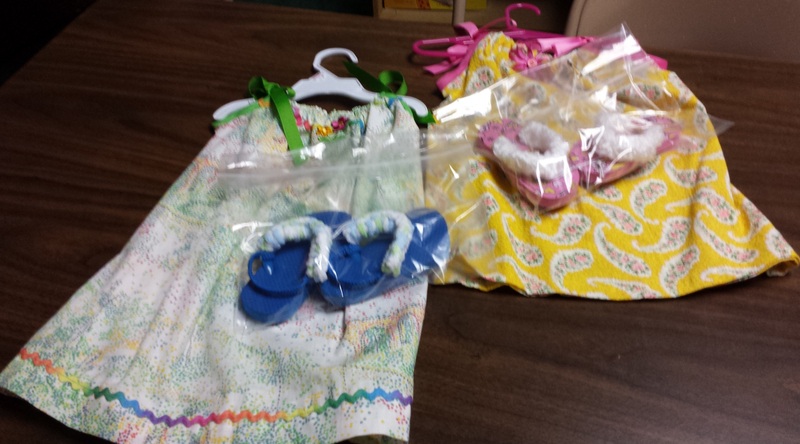 These dresses, flip-flops, dolls, shorts, and tee shirts have reached children at home and around the world as they were given to the local school resource center, sent to an Indian reservation in South Dakota, to Haiti, Africa, Brazil, Jamaica, and the Philippians. The ladies also make fleece blankets, backpacks, and participate in the Samaritan Purse Operation Christmas Child. They deliver meals to families in and around their church when there is a sickness or other need. Quarterly the WMU sends financial donations to Wycliff, to the Laurel County Life Center, and to the Anti-Abortion Clinic. Such an active church. Such a giving church. A church involved in lots of outreach projects. Yet they are looking for ways to better reach their community. Slate Hill Baptist Church was established in 1831 and, though small in number (with an average Sunday AM worship attendance of 44), they are BIG in heart. As part of the Kentucky Baptist family they are also involved in reaching their community, state, nation, and the world with the Gospel of Christ through their gifts to the Eliza Broadus State Missions Offering, the Annie Armstrong Easter Offering, the Lottie Moon Christmas Offering, and the Cooperative Program. We thank God for these faithful WMU ladies, for Pastor Homer Johnson and his leadership, and for the entire church. Is your church or association prayerfully considering a new mission partnership, or desiring to begin one for the first time? If so, the KBC has a wealth of requests for mission partnerships that may be just right for your group. But how does one go about choosing a mission partnership and what does that partnership look like? Let me suggest some mission partnership considerations. First, what does a mission partnership look like? Mission partnership nuts and bolts are rather simple. We suggest that mission partnerships be long-term (3-5 years). Relationships take time. Further, if possible, send multiple teams a year. For instance, instead of sending a team of twenty, send four teams of five throughout the year. Still yet, make sure that the partnership is gospel-centered. This may seem obvious, but there are times when doing acts of mercy, for example, end simply with giving out food or constructing buildings. While these are great ways to demonstrate love, the gospel is what changes lives. In addition, intentional mission partnerships allow the local church/ministry/missionary to determine the needs. Mission teams submit to the needs expressed from the field, which leads to the last nut and bolt of partnerships. Be a servant. Now, what about deciding on a partnership? Prayer is essential. Along with prayer, the best way to decide on a partnership is through experience. Vision tours are a tremendous way to experience (touch, taste, hear, see, etc.) areas in need of gospel impact. We have four such vision tours planned in the coming months. Perhaps you would join us in experiencing the lostness of certain areas in our country and world in order to see if God is leading your church or association to partner for Kingdom advancement. Our Cincinnati Vision Tour is September 28-29, 2015. Join us in this NAMB strategy to reach the greater Cincinnati area with the gospel. We will meet with church planters and experience the tastes and sights of this river city. For more information or to register visit: www.kybaptist.org/cincy. Salt Lake City is in great need of gospel partnerships. Our NAMB church planters there are asking for your help. This vision tour is scheduled for November 2-4, 2015. Come and see how your church or association can partner with church planters in Salt Lake City to push back the darkness through the light of Jesus. São Paulo, Brazil is one of the largest cities in the world with over 20 million residents. The opportunities for gospel engagement are almost limitless. January 31-February 6, 2016, we will venture through this city with IMB missionaries and former KBC leaders, Scott and Joyce Pittman. Europe sits in darkness and is in need of Kentucky Baptist partners to come alongside of IMB personnel to have gospel impact. Of the 800 million people in Europe, missiologists tell us that 99% are lost without Jesus. Within Europe, France is a country where many do not even believe that God exists. We need churches and associations that will take the gospel back to the place that once flourished with the gospel. April 5-16, 2016, we will explore gospel partnerships in this European region. These four vision tours allow you and your group to seek God’s guidance as you prayerfully discern where He is leading you to partner for Kingdom impact. For the Cincinnati tour, see the web link above. If you are interested in Salt Lake City, Brazil, or France, please contact Doug Williams, 502-489-3420 or [email protected], for more details. For more partnership opportunities, visit our web at www.kybaptist.org/go. Search by length, location, or project. Indeed, mission partnership opportunities abound!